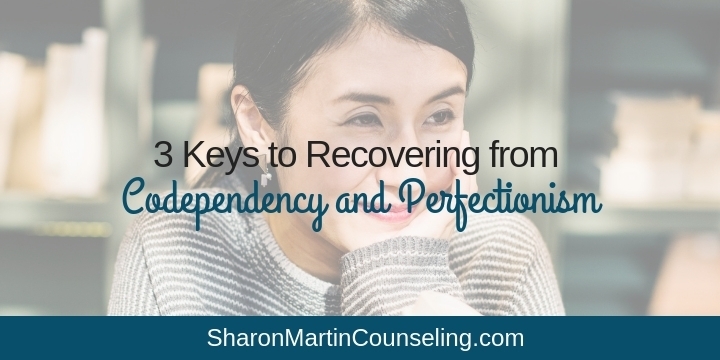 3 Keys to Recovering from Codependency and Perfectionism - Sharon Martin, LCSW Counseling San Jose and Campbell, CA ? These are the kinds of statements I hear every day from men and women who are struggling with codependency and perfectionism. 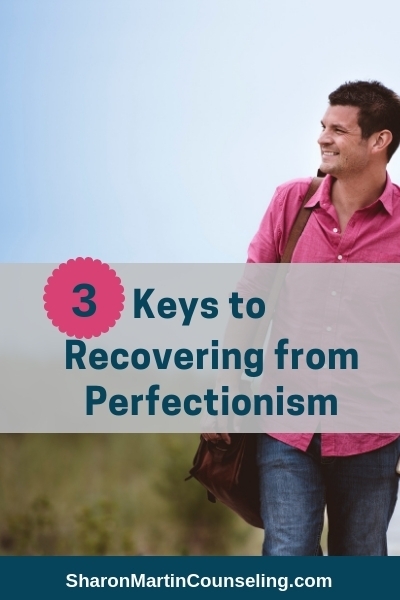 The roots of both codependency and perfectionism lie in a lack of understanding and valuing yourself. Your focus is outside yourself – either on other people or on achievements. Even if you don’t identify with codependency or perfectionism, you may find that you struggle with knowing, loving, and being yourself. These seem to be common struggles. Our lifestyle keeps us so busy, distracted, and disconnected that it’s common to lose your sense of self and self-worth. 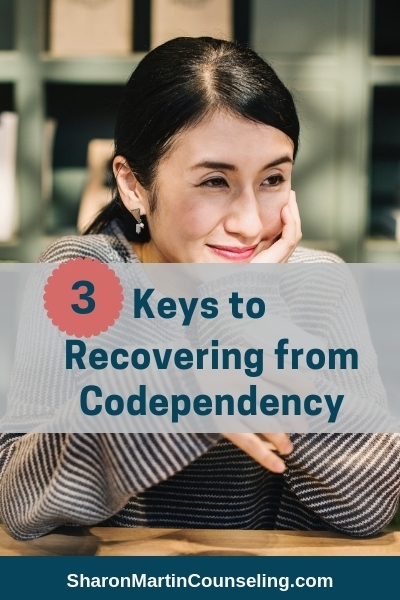 Most people with codependency never developed a strong, independent sense of self. When you focus on taking care of others and making them happy, you lose track of who you are and what you need. You become who everyone expects you to be. You morph into whatever version of yourself will keep the peace. You tuck away your own thoughts and feelings, for so long and so deeply, that you no longer know what they are. You’re more than your job and family roles. You’re complex. You’ve got strengths and weaknesses. You’ve got preferences and beliefs. Figuring out what they are takes time. Rediscovering yourself isn’t something you do in a weekend or even a week! Generally, it involves brainstorming and experimenting to see what you like to do; trying on different ideas, opinions, and beliefs. Finding your true self requires that you turn inward, focus less on others, and pay attention to what your mind, body, and spirit are telling you. Once you know who you are, you can ask for what you want or need. If, for example, you discover that you need a lot of quiet time alone, ask for it. Or conversely, if you find you’re energized by being out and about, seeing new things, then plan for this. Sometimes greater self-understanding can be the impetus for larger changes such as ending a relationship or finding a new place of worship. Making these kinds of changes takes courage. Again, remember this is a process; go slow and trust that your needs and wants will be revealed, and they are valid and important. Individuals with codependency or perfectionism don’t think very highly of themselves. Sometimes people are conscious of this and sometimes they aren’t. Your thoughts (what you say to yourself when you screw up or when things don’t go as planned) and behavior (the way you treat yourself, the way others treat you, the choices you make) will reveal how much you love yourself. Self-love is essential because if you don’t love yourself just as you are, I can guarantee that no one else will either. The problem is that you fixate on your flaws and mistakes, and underestimate your contributions and strengths. Often this began because your parents and/or other adults told you a lot of negative things about you. Naturally, a fair amount of that criticism was internalized and continues to influence your thoughts and behaviors even if they’re not true. I’m not going to lie – it can be tough to erase these old tapes, but you can do it a piece at a time. Once again, the solution requires slowing down and tuning into yourself so you can increase awareness of your thoughts and feelings. When you notice that you’re judging yourself harshly, scolding yourself like your mother did, or rehashing past mistakes, take some time to challenge your thoughts. Is there real evidence to support your negative self-assessment? Would you talk to a friend as you’re talking to yourself? Are your expectations for yourself fair? How can you offer yourself compassion? Part of learning to know yourself is also learning how you like to be comforted and encouraged. The most important thing to remember about self-love is that it doesn’t have to be earned. Love should be unconditional. Love yourself no matter what you’ve done or whether you think you deserve it. Love has the power to transform you for the better. It can be scary to “show up” just as you are. People might not like you; they might reject you; they might leave you; they might judge you. As you know, it’s really tempting to let the “perfect” persona that you’ve created show up for you. This is a people-pleasing, perfecting, overly responsible, always-working, conflict-avoiding version of you. But the real you is so much more than what people see on the surface. People with codependency and perfectionism struggle to share their authentic selves. This makes sense; if you don’t know who you are and/or don’t feel good about yourself, you’re going to have a hard time letting people in and being vulnerable. When you know and love yourself, you can show up as you are rather than being a chameleon. You can own what you like and believe in, rather than feeling embarrassed, worrying that your interests are stupid or uncool. Does it really matter if your father-in-law thinks your vegan diet is finicky and unhealthy? So what if no one else likes playing the bagpipes and hairless cats? If that’s what you love and who you are, own it! Not everyone will agree and that’s just fine because when you know and love yourself, you’re less dependent on others to validate your worth. Know yourself. Love yourself. Be yourself. Let that be your mantra. This post was originally published by the author on PsychCentral.com. Thank for this wonderful post! Courage is not the absence of fear, it is action despite feeling fear. We just have to be ready to accept who we really are. And if failure exist, learn to forgive yourselves. And moved on. Wow , You just described me and I could never have articulated it the way you did. Thank you Sharon.